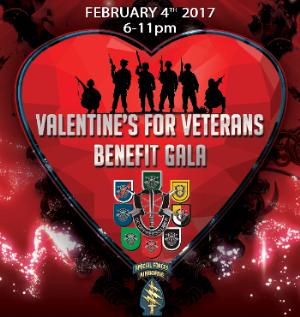 All American Music Productions and The Special Forces Association Chapter LX invites you to Valentines for Veterans Benefit Gala! Join us for a night of Live entertainment, food and dancing as we honor The Special Forces Association! Proceeds from this event benefit will be donated to SFA CHAP 60, a not-for profit corporation organized under Florida law. Valentines for Veterans Benefit Gala will support the charitable activities and future team house of Chapter LX. Charitable activities to include the Richard J. Meadows Memorial Scholarship program, the Special Operations Warrior Foundation, the Green Beret Foundation, the SOF Memorial, American Legion Post #139 and other local veterans causes. Your individual, corporate donations and sponsorships will allow us to combine our efforts in supporting these wonderful charities and special operations causes.